Abraham Hyatt NASA Official Abraham Hyatt, 88, an aerospace engineer who supervised early development of the manned lunar landing program at the National Aeronautics and Space Administration, died of cancer September 25, 1998 at a hospital in Santa Monica, California. He lived in Pacific Palisades, California., and Shady Side, in Anne Arundel County, Maryland. Mr. Hyatt worked at NASA from 1958 to 1965, serving as director of plans and program evaluation. He retired in 1976 from Rockwell International Corporation, where he was director of business development for aircraft and space operations. He was born in Ukraine and raised in Birmingham, Alabama. He was a graduate of the Georgia Institute of Technology. He began his career in 1937 with the Glenn L. Martin Aircraft Co., and then was chief structural engineer for McDonnell Aircraft Corp. He served in the Marine Corps in Germany and Eastern Europe during World War II and retired in the 1970s as a colonel in the Marine Corps Reserve. Mr. Hyatt was chief scientist of the Naval Air Systems Command, where he worked on the Polaris missile program, and served on a space technology committee of the National Advisory Committee for Aeronautics before joining NASA at its inception. He was a visiting professor at the Massachusetts Institute of Technology, a member of science advisory committees to the president and the Air Force, and a fellow of the American Institute of Aeronautics and Astronautics. His honors also included the Navy Distinguished Civilian Service Award. 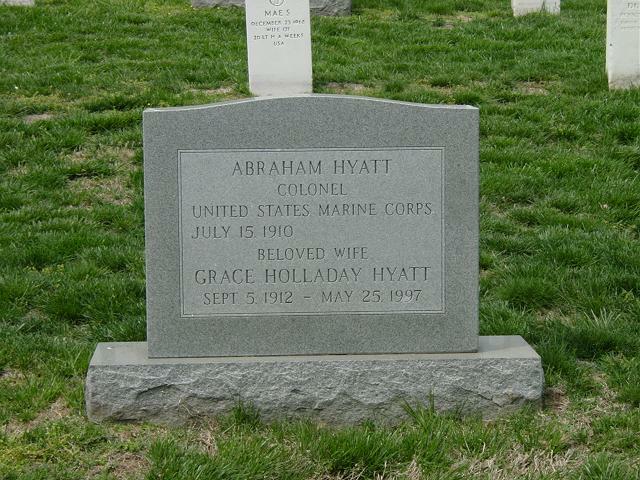 His wife, Grace Holloday Hyatt, died last year. Survivors include two children, Sherry Hyatt of New York and Robert Hyatt of Charleston, S.C.; two sisters; and a grandson. On September 25, 1998, of Pacific Palisades, California, husband of the late Grace Hyatt; father of Sherry Hyatt; brother of Bessie Goldner, Rena Wachsman and Robert Hyatt; grandfather of Abraham deWolf. Funeral services will be held on Wednesday, October 14 at 11 a.m. in the Memorial Chapel at Fort Myer with Full Military Honors. Interment to follow in Arlington National Cemetery.